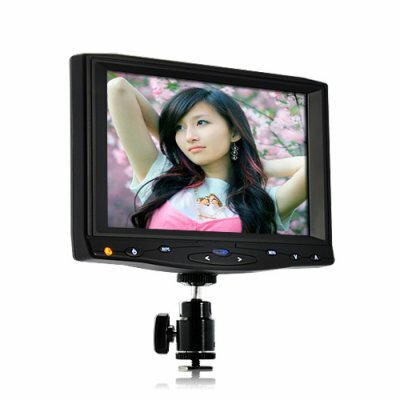 Successfully Added 7 Inch On-Camera HD DSLR Monitor - 1080P, HDMI, AV, 10 Hours Working Time to your Shopping Cart. This on-camera monitor for DSLR operates for an ultra long ten hours and provides a clear and accurate image of what’s being recorded without having to look through your camera’s tiny built-in monitor. This makes framing, focusing and previewing faster and easier - while allowing you to position the monitor at different angles without being forced to keep your eye level with the back of the camera. 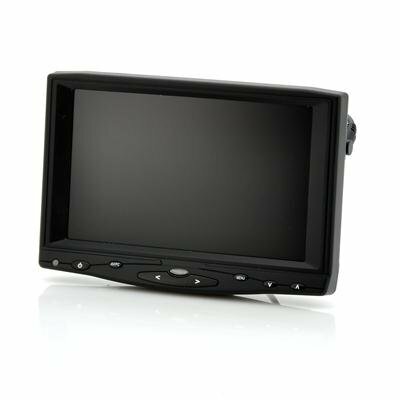 With the enhanced 450 cd/m2 backlight and a 500:1 color contrast ratio, this monitor produces a crystal clear picture and shows colors vividly even used under sun light. Additionally, a light-hood is also provided to ensure a perfect picture under excessive lighting conditions as well as image adjustments like color temperature, red, green, blue adjustments, image flip and more. Shooting video with a DSLR means you are stuck operating from the small low-resolution screen to judge critical focus and exposure. Make things clear and easy for yourself and upgrade your DSLR camera with this on-camera HD DSLR monitor today! Direct from the OEM factory, this product is about 4 times cheaper than the same exact branded model that’s currently selling at major online resellers. Order now and we’ll express ship your order and even back it with our full one year warranty. Brought to you by the leader of high quality low price wholesale electronics, Chinavasion. This monitor uses a Sony F970 within the battery case and the battery is included. However this monitor is also suitable to use with other cameras through its included power adapter.